Lent provides us with an opportunity to tell this story of love - to enter into the amazing journey of self giving, transformative, love. Now does that sound like the Lent you came to know and hate as a child? That’s the Lent of self-flagellation, the Lent of bruised knees, and displaced egos. Not to make light of it, Lent indeed is a time of self-reflection, introspection, intention, and even of denial. 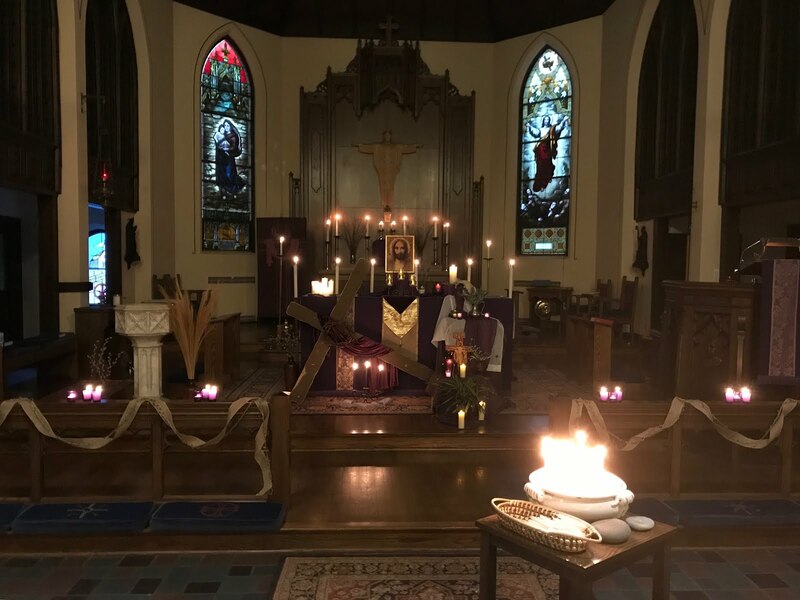 Lent affords us this opportunity to lay down that which holds us hostage, to deny ourselves that which holds our attention away from goodness and kindness. But not because we're bad people and we need to be punished, but to free us to live the life of love that God intends for us. Eugene Peterson’s translation in The Message, of this passage of John, “This is how much God loved the world: He gave his Son, his one and only Son. And this is why: so that no one need be destroyed; by believing in him, anyone can have a whole and lasting life. God didn’t go to all the trouble of sending his Son merely to point an accusing finger, telling the world how bad it was. He came to help, to put the world right again. Anyone who trusts in him is acquitted; anyone who refuses to trust him has long since been under the death sentence without knowing it. And why? Because of that person’s failure to believe in the one-of-a-kind Son of God when introduced to him." This is the truth. And the truth sets us free. God loves us, and in John’s gospel we know about the gift of that love is so huge, so unimaginable, so extravagant, so full of grace, that we take forty days every year to bask in it, to pay attention to it, to do something about it. It's enough to leave me breathless, and laughing, and in awe, and speechless. But not so speechless as to stop talking. Forty days, it's a good thing we have this opportunity each year, because it takes a life-time, a life-time, to absorb the reality of this love. And yet, we continue to behave as if God's love for us is not true. We continue to behave as if we know best and we are in control. Even when we know that is not true. We do our very best to anticipate and control the direction of our lives. We do our very best to build our brick houses. We do our very best to have hefty retirement accounts. And why not? It’s good to have some assurance of security in our old age. Insurance and retirement accounts are the very backbone of our economy. But not of God's economy. Lay that all down, God says to us, lay those worries down, and let my love bear you up. That is God’s call, and that my friends, is not easy to do. Sometimes, most of the time, God's way is the more difficult way. The path we are on brings us by still waters, but this path is surely not paved with gold or even asphalt. God's path is more arduous, it is more vulnerable, and it is more challenging than we want it to be. But it is the way of truth, it is the way of love, it is the way of life lived fully and completely. But it is so very hard to surrender to, and that is what this forty day practice of Lent calls us to. Jesus knows that. On the night his life was given to the authorities, he went to the garden and prayed, "Father, if it is possible, take this cup of suffering away from me. However - not what I want, but what you want. "(CEB) How often do we pray the first part of that prayer? God, take this away, usually as a transaction with God. God, if you take this away, if you save my live, if you do what I want you to do, then I will come to church, then I will change my ways, then I will do what you ask me, maybe. But we already know that God's love is not a transaction. God's love is not a proposition, if you do this God, then I will do that. No, God's love is freely given, it is unconditional, and it is available to everyone. It's the second part of Jesus' prayer that is problematic for us, "but what you want." Not what I want, but what you want Jesus. That is incomprehensible for most of us. We are so accustomed to getting what we want, we are so conditioned to believe that what we want is best for us and for everyone around us, that the thought of giving over power, giving over control, is inconceivable. No wonder we need forty days every year to intentionally practice that which claims our lives and our hearts and even our heads. When we profess our faith we say that we died with Jesus, and are raised to new life, this is what that means. During Lent we spend some time reflecting on that very thing, what dying with Jesus means, what new life means, what God wants for us and with us. Our baptismal promises point us in that direction. Here at Trinity we have been wondering about what it is our baptismal promises call us to, whom we are called to be. We ask those questions both as individuals and as a community of faith. We also state that we believe God's mission in the world is healing and wholeness. We believe that the wears and tears of the world break us up, pull us apart, fragment us, and God puts us back together. When we lay our lives at the foot of the cross for God's love and healing, when we say your will be done, we are made whole, and that sort of vulnerability also makes us compassionate and merciful. We eat and we drink the life and the love of Jesus, and we are put back together. With that compassion and mercy, we are sent into the world as God's missionaries, to love and to serve, to walk the path with all those we encounter, to offer God's love. We are not sent out alone, we are sent out as a community of faith, as a community put back together as the body of Christ. Now we begin to enter the darker and more violent parts of this story. The time is coming when the crowds will call for Jesus' death. But we enter the darker part of this story armed with the assurance of the light. I am reminded of something Martin Luther King Jr. said, "Darkness cannot drive out darkness; only light can do that. Hate cannot drive out hate; only love can do that." And this is what we do. We live in the world as beacons of the love that wins, as carriers of the light that will not be put out, as practitioners of mercy and compassion. Amen.